Include a Charity is a successful collaboration between many of Australia’s favourite charities, covering a range of causes and aspects of our community, from medical research, education, animal welfare, the environment, the arts and more. Our objective is to encourage more people to leave a gift in their Will, with the ambitious goal of increasing the number of people who leave gifts in their Wills to 15% by 2020 and generating an additional $440 million for the charitable sector. The Include a Charity campaign relies on the support of its campaign supporters, volunteers and partners. We also rely on the support of the legal profession to assist their clients in leaving a charitable gift in their Will. Your prompt about leaving a charitable gift in their Will could make the world of difference, both to your client and their legacy, and to the charity they nominate as a beneficiary. Giving to charity is something that many of your clients may be very passionate about. When asked, almost a third of Australians indicated that they would consider including a bequest to a favourite cause or charity in their Will. Reality shows that only 12% actually do. Only one in twelve Australian currently do include a bequest in their will. The reason for this intention-action gap is that Australian solicitors rarely ask clients about charitable bequests. 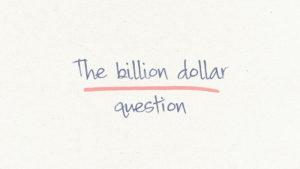 If they did, the data shows charities would receive at least a billion dollars more every year. The difference one simple question can make is staggering. Not only will it help more Australians get the Wills they want, it’ll help more charities have more money to do more good. As a provider of professional legal services, many Australians will come to you to draft or update their Wills. The single most significant factor that has helped to increase the incidence of charitable gifts in Wills in the UK and the USA is the mention of charities by a solicitor at the time a Will is being prepared. A study in the UK has shown the difference that solicitors are already making there by asking a question about philanthropic gifts in Wills: the number of charitable gifts increased from 4.9% when the option was not mentioned by the solicitor to 10.8% when the question was asked: an increase of 120%. This is where you have a critically important role to play: your actions can help fulfil your clients’ philanthropic wishes. Furthermore, by encouraging them to share their wishes with their family, you can help prevent any surprises or contested Wills arising further down the track. Recent research shows that clients are increasingly mentioning their interest in including a charitable gift in their Will with their solicitor. 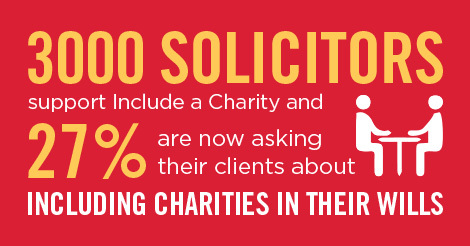 In the light of this growing interest, solicitors are also are becoming more proactive in their recommendation and providing information on charitable gifts in Wills. Download the executive summary to our latest research.